The Southeast Asian island of Borneo sustains some of the world’s most important surviving rainforests — among the oldest and biologically richest forests on Earth. But an ambitious road-building spree by the Indonesian government will fragment and destroy vast areas of the island’s rainforests, according to an authoritative study (available here and also see this compelling video). Its authors include several members of ALERT. “You’d be hard-pressed to identify scarier threats to biodiversity anywhere on Earth,” said Dr Mohammed Alamgir, an ALERT member and lead author of the study. “Borneo’s forests and rare wildlife have already been hit hard, but planned roads and railways will shred much of what remains, slicing across the largest remaining forests,” said Professor Jatna Supriatna from the University of Indonesia, one of the co-authors. In a global sense, these threats are especially worrisome. Despite suffering major forest loss since the 1960s, Indonesian Borneo — a region known as Kalimantan — still sustains one of the world’s largest expanses of tropical forest, spanning some 37 million hectares (93 million acres). 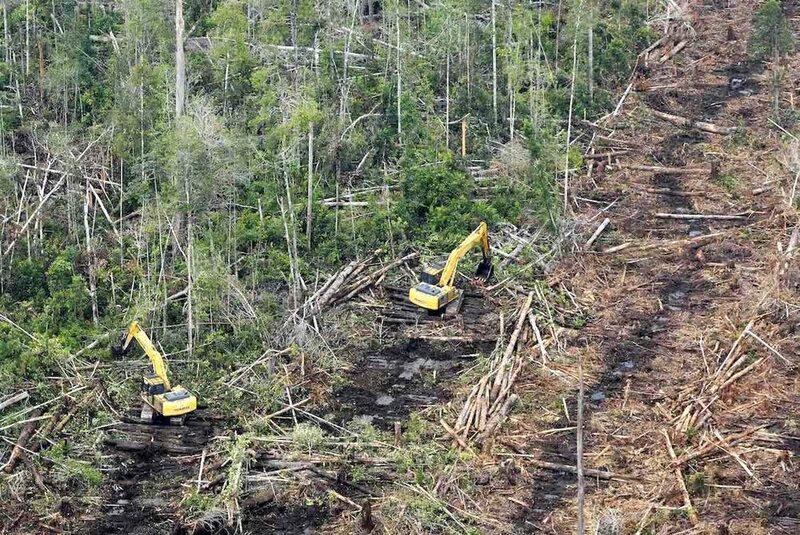 The new roads and rail projects are part of an ambitious plan by the Indonesian government to expand infrastructure, in large part to accelerate logging, mining, oil palm plantations, and other forms of intensive development. “For wildlife such as an Pygmy Elephants, Sun Bears, Bearded Pigs, and Bornean Orangutans, this is the worst possible news,” said ALERT director Bill Laurance, another co-author. To find food and shelter, such wildlife species must move to survive. Their mass migrations to find food occur during frequent famines in the rainforest. Such famines occur because many trees in Borneo and elsewhere in Southeast Asia produce fruit and seeds in a highly staggered and patchy manner. This means wildlife must migrate over large distances to find food — or face starvation. 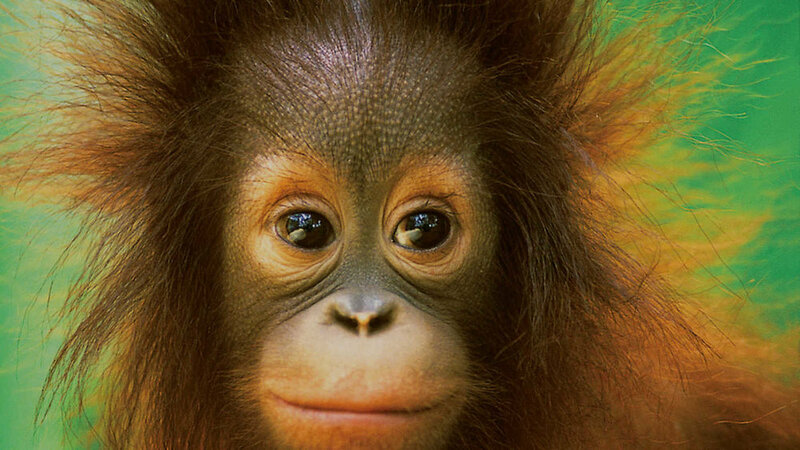 Borneo is crisscrossed by numerous migratory pathways for animals — some spanning hundreds of kilometers in length. Red lines show some known migration routes of Bearded Pigs in northeastern Kalimantan, Borneo. Alarmingly, many of these pathways have already been disrupted. Many more will be destroyed by the new road and rail projects and all the forest exploitation they would bring. 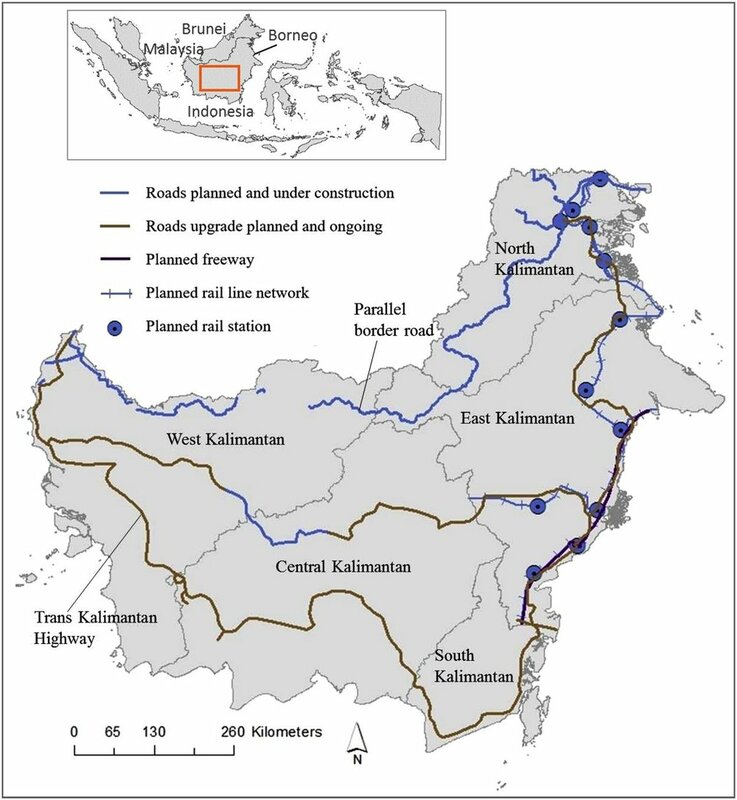 The research team used satellite images and computer models to estimate the impacts of the expanding road and rail network across Indonesian Borneo. They found the roads would reduce “forest connectivity”— the degree to which forests are spatially linked together — sharply, by 34 percent in total. This is an alarming figure, indicating a giant leap in fragmentation and loss of Borneo’s surviving forest tracts. 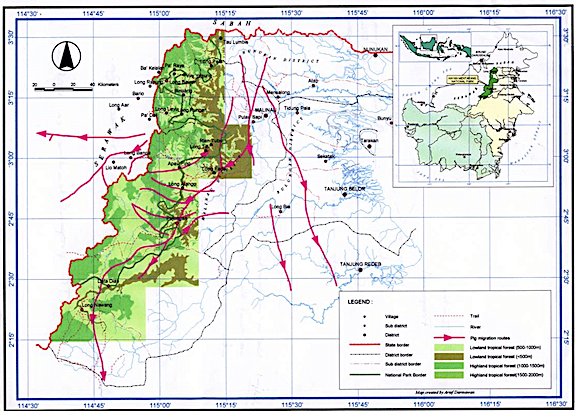 If completed as planned, the projects will sharply increase forest fragmentation and reduce forest connectivity for wildlife (forests with different colors are in separate, isolated tracts). And that’s just the tip of the iceberg, because the new roads and rail projects will also open up the forests like a flayed fish, allowing illegal colonists, poachers, and miners to invade and cause even more forest disruption. On top off this, the study shows that the new projects will slice through or degrade 42 national parks and protected areas in Indonesian Borneo, making them far more vulnerable to illegal poachers and encroachers and road-kill by vehicles. 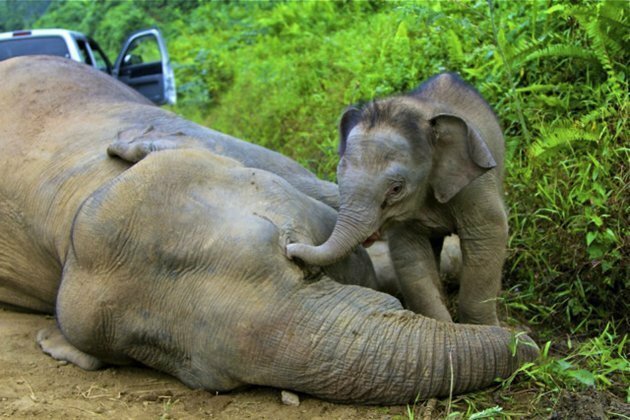 Many parks in Indonesia are largely devoid of wildlife because of chronic poaching. These projects and their aftermath are scary for biodiversity. But they will also have major impacts on people, by increasing destructive flooding, and causing major greenhouse-gas emissions from deforestation and forest burning. 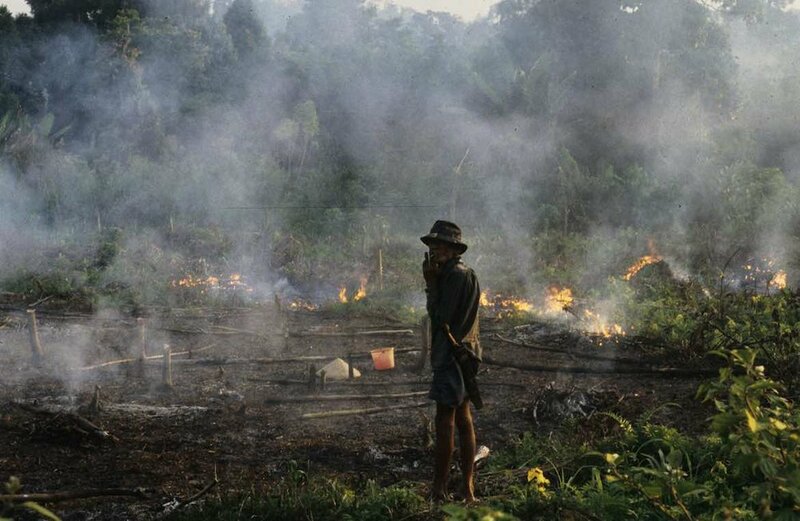 The Borneo fires are also a major cause of the severe, noxious haze that regularly blights Southeast Asia. In 2015 alone, the haze may have caused the premature deaths of over 100,000 people. Indigenous Dayak peoples in Borneo are also vulnerable. Foreign logging, oil palm, and mining corporations have hugely disrupted the island’s traditional inhabitants, destroying many of the forests, wildlife, and swidden-farming plots on which they have long relied. Big foreign investors, commonly from China, have been associated with serious corruption and bribery of Indonesian government officials. As a result, many high-risk projects — with dubious benefits and massive environmental and socioeconomic risks — have been approved, secretly sold to the highest bidder. 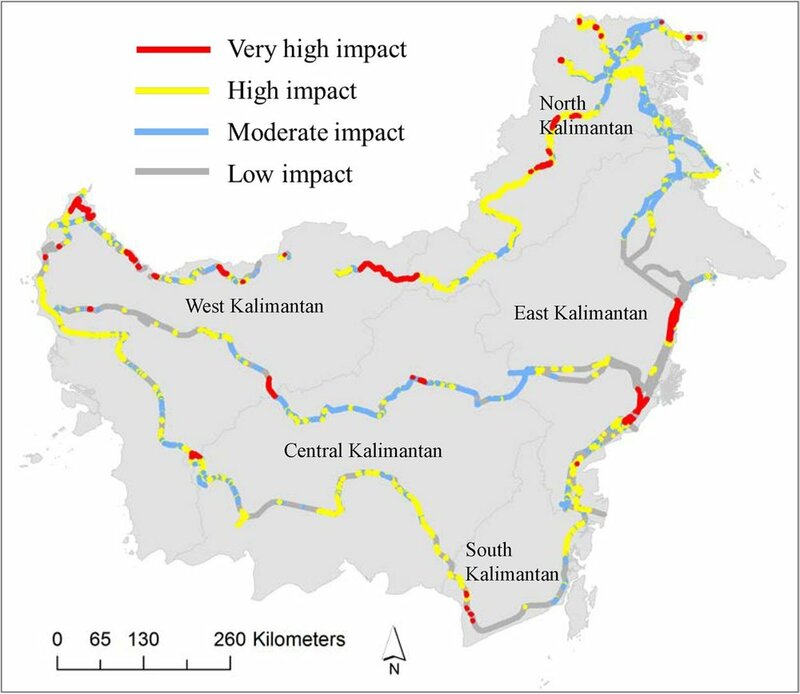 According to the study, the worst projects in terms of disrupting Borneo’s forests include (1) roads in the provinces of West, East and North Kalimantan, (2) several major new Trans-Kalimantan roads, and (3) freeways and rail lines in East Kalimantan. Tthe most dangerous segments of the planned and ongoing projects, in terms of their likely impacts on forests and wildlife. The first step in building opposition to these environmentally devastating projects is increasing public understanding of just how bad they will be. Right now, that is the top priority, with groups such as ALERT, the Borneo Futures initiative, and LEAP (Land Empowerment Animals People) trying to generate public interest. You can help by spreading the word widely too — to friends, colleagues, and journalists. 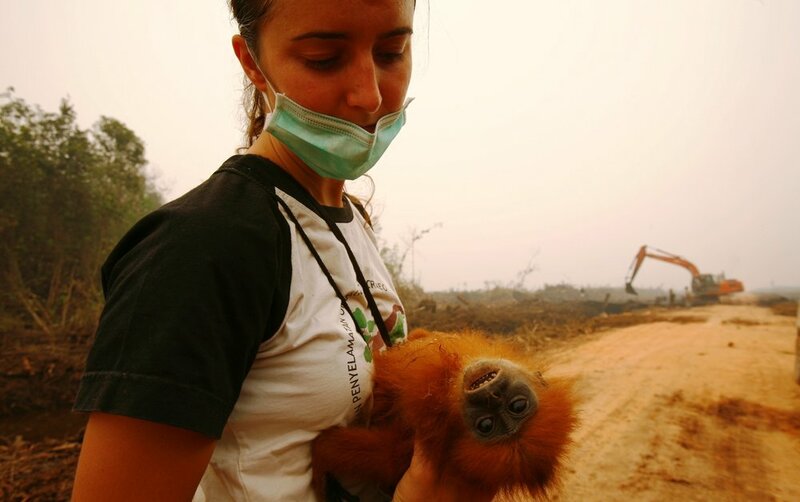 This new research provides a scientific slam-dunk to support such efforts — showing that these aggressive projects will be like a dagger in the heart of Borneo’s rainforests.